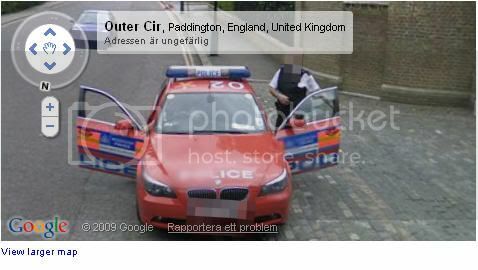 This police car has followed the google car around the London Central Mosque. Images behind the car back to Hanover Gate intersection have been removed. Forgot to add images ahead of the pull over have been removed as well. So why leave the ones of the cops getting out the car? Note faces blurred after the fact. This is a Diplomatic Protection Group police car. The license plate visible in the second map above reveals that it is the same car pictured on the Wikipedia page linked here.